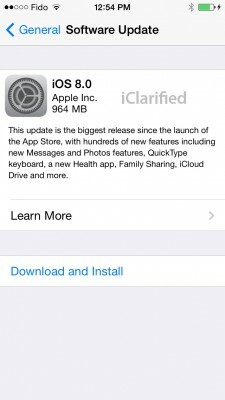 Earlier this week it was reported that iOS 7 doesn’t encrypt email attachments, though it should. The only possible way out was not to detach important or confidential files to emails, but fortunately, another one appeared on Wednesday. 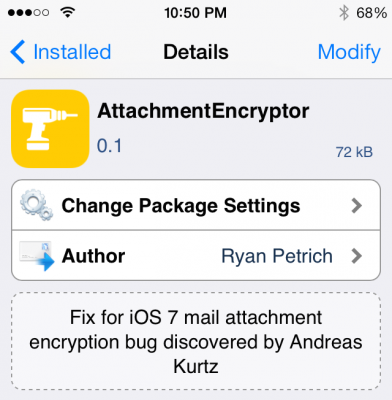 A developer named Ryan Petrich released a new jailbreak tweak that helps to fix the email encryption issue. This tweak is called ‘Attachment Encryptor’. 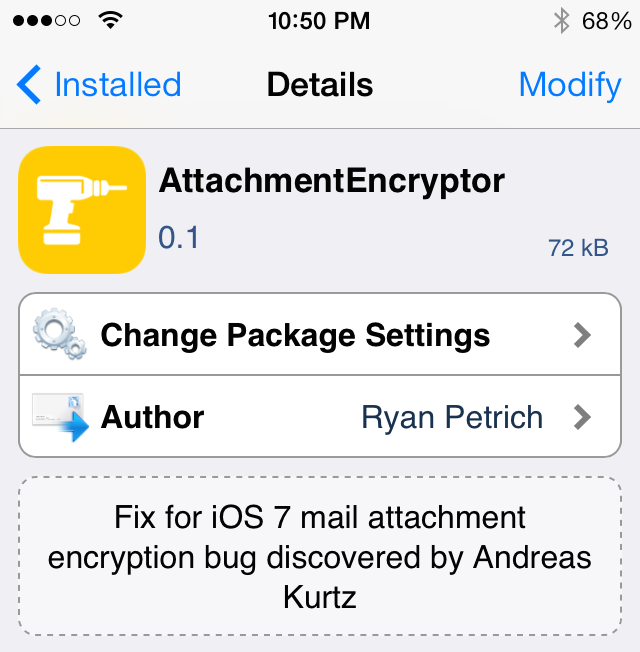 Prominent jailbreak developer Ryan Petrich released ‘Attachment Encryptor’ this evening, a tweak that patches the aforementioned bug. 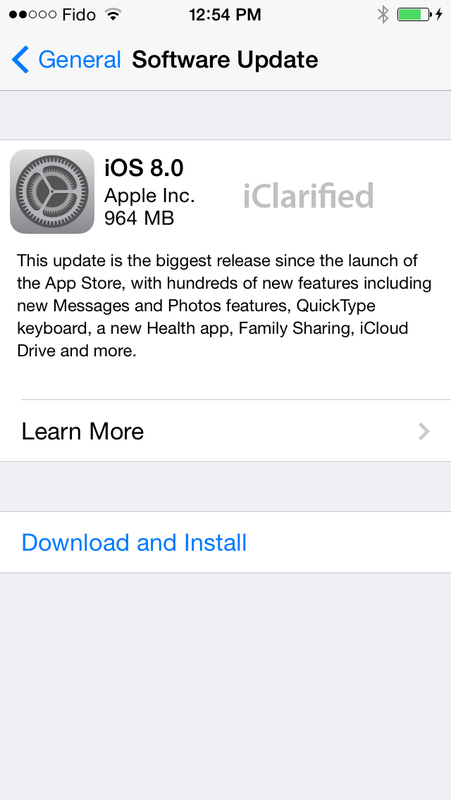 All you have to do is install it and respring your iPhone or iPad. The tweak is available for free via Petrich’s beta repo. You can add it by entering ‘Manage’ tab in Cydia and hitting Sources and Add sections. After you select the last menu, you need to enter http://rpetri.ch/repo/. That’s all. 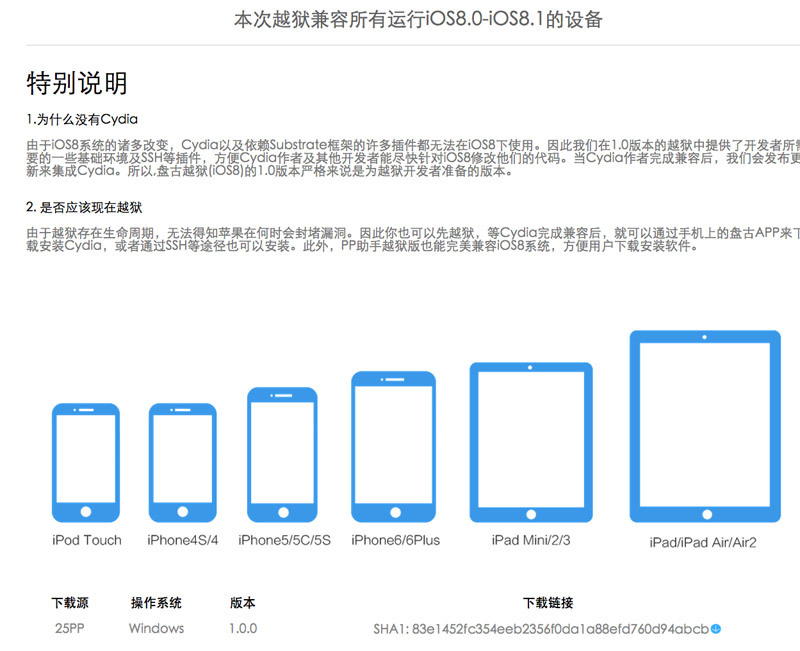 I honestly hope that Apple will fix the issue in the next iOS version. This article is about adverse issues experienced by customers who have made unauthorized modifications to iOS (this hacking process is often called ”jailbreaking”). Instability: Frequent and unexpected crashes of the device, crashes and freezes of built-in apps and third-party apps, and loss of data. Security vulnerabilities: Security compromises have been introduced by these modifications that could allow hackers to steal personal information, damage the device, attack the wireless network, or introduce malware or viruses. Disruption of services: Services such as Visual Voicemail, Weather, and Stocks have been disrupted or no longer work on the device. Additionally, third-party apps that use the Apple Push Notification Service have had difficulty receiving notifications or received notifications that were intended for a different hacked device. 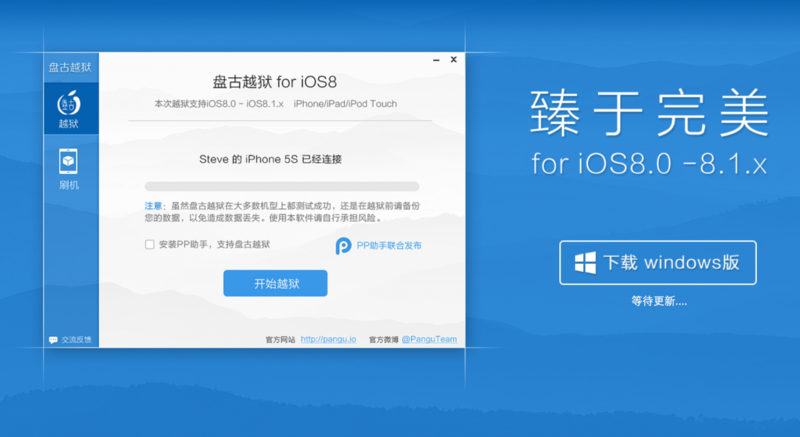 Other push-based services such as iCloud and Exchange have experienced problems synchronizing data with their respective servers. 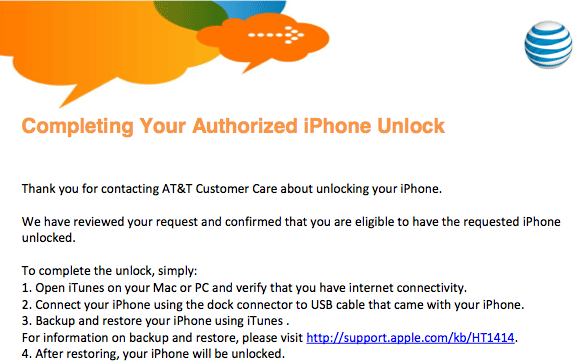 As announced, AT&T has begun unlocking off contract iPhones for customers. TNW details the procedure. If you quality you can contact the company via phone, chat, or in-store. The only piece of information required by AT&T is the International Mobile Equipment Identity (IMEI) number, which can be found under Settings -> General ->About on your device. Then in 72 hours you will receive email confirmation. The maximum amount of unlock codes that can be given to an account is 5/year. You can see a copy of the unlock confirmation below. Apple reportedly asked Toyota to remove from Cydia its exclusive theme created by Toyota’s advertising company Velti for promotion of its new vehicle and available for jailbroken iPhones. Scion, a brand of vehicles manufactured by Toyota, recently developed a custom iPhone theme specifically for jailbroken devices, submitting it to us for hosting in Cydia. As far as we know, Apple is strongly against jailbroken devices but this advertising campaign may somehow help to legitimize the jailbreak community and also place it in direct competition with Apple’s own iAds network. Apple apparently heard about the campaign and has asked Toyota to pull it. I received a call from our contact at Velti this evening as well as an email asking me to please take the theme out of Cydia. On the phone, he explained Apple had contacted Toyota and requested they remove the theme and stop the advertising campaign. They (Velti) in turn contacted me relaying the message. The reason Velti listed for the removal request of the theme emailed through our dev portal was “Toyota’s making us take it down” Toyota had agreed to do so to “maintain their good relationship with Apple,” our Velti contact told me on the phone. Everybody knows that the iPhone Springboard can’t be turned in landscape mode. Apple wants you to hold the device in portrait mode only. But some apps, like Mail, support the horizontal orientation. So, Cydia developers offer us the alternative solution, a new hack available in Cydia called “SBRotator” ($1.99). If you change your iPhone’s orientation, using the app, the Springboard will just follow it. But Springboard orientation change requires a proper layout change too. SBRotator puts an extra tab which enables you find the configuration that best suits your needs. Moreover, the program allows you to resize icons for landscape mode. Steve Jobs, Apple’s CEO, confirmed that the new software update iOS 4.x will appear in the near future to correct performance problems on the iPhone 3G, which works on iOS 4.x. 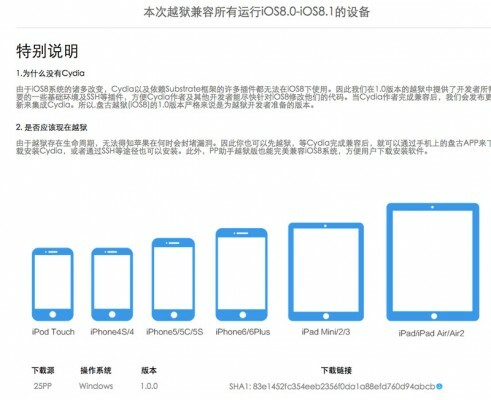 He confirmed it while answering to the email he got from a user who was disappointed with the iPhone 3G performance running on iOS 4, describing it as “dog slow”. Although he did not mention a specific version or date of its release we can guess that he was specking about iOS 4.1, which is going to be released next month, when iTV (Apple TV) and the next generation iPod touch will spotlight. For now Apple isn’t banning Jailbreakers – they’re banning people who actively work to find exploits in the iPhone software to create Jailbreaks for the rest of us.